Australian cinephiles will be well and truly aware by now of the stir that Aleksandr Sokurov’s Russian Ark has produced around the globe. The film has sent many a respected film critic into raptures over its artistic and technical merits. Our own filmmaking culture is so often accused of being formally and thematically conservative that it is worth examining any overseas film that has been almost universally hailed as groundbreaking on both counts, and asking what lessons, if any, it can offer Australian filmmakers. Russian Ark takes place entirely in and around St Petersburg’s Hermitage Museum, formerly the Czar’s Winter Palace. As the film opens, the audience immediately have the sense of falling into a dream. We hear an unseen narrator, through whose eyes we see the entire movie, mutter something about experiencing an accident, and suddenly finding himself stumbling into the Winter Palace, unseen amongst a group of 19th century aristocratic revellers. Inside the Palace, he comes across a fellow time traveller, the Marquis Astolf De Custine, a 19th century French diplomat, and the 2 begin a journey through 33 rooms and 300 years of Russian history. Among other things, they see Catherine the Great wandering in the snow, Czar Nicholas II dining with his family, and the last great ball held at the Palace on the verge of the First World War in 1913. One of the primary reasons Russian Ark has attracted so much attention is the film’s immense technical accomplishment. By shooting on high definition video and recording the uncompressed image straight onto hard disk, Sokurov was able to capture the film’s action in a single, uninterrupted take lasting approximately one and a half hours. When one considers that the film involves a thousand extras, takes place in 33 different rooms, and had to be set up and shot in the course of 3 days (the time the Hermitage’s directors were prepared to have the museum closed to the public), one begins to comprehend what a stupendous technical feat Russian Ark is. What all this logistical genius actually adds up to, however, is at best an empty spectacle dressed up with all the trappings of old world, pre-modern classical art, and at worst, a deeply conservative and ahistorical piece of reactionary nostalgia. There is a long tradition of modernist filmmaking heavily reliant on the long take, stretching back at least as far as the Italian Neo-Realist films of the 1940s. The contemporaneous commentary on Neo-Realism provided by French critic Andre Bazin still provides an incisive reading of the philosophical implications of this stylistic approach. At first glance, a single-shot film like Russian Ark may seem like the realisation of the ultimate Bazinian filmmaking fantasy, but as Benjamin Halligan argued in a recent essay in Senses of Cinema, Russian Ark actually goes against all of Bazin’s philosophical ideas [www.sensesofcinema.com.au]. Not that Sokurov is obliged to conform to the views of a long-dead French film critic. However, the ways in which Russian Ark violates what Halligan calls the “Bazin maxim” can illuminate how the film’s seemingly innovative technical approach dovetails with its conservative and profoundly anti-modern agenda. For Bazin, the long take had value only to the extent that it left the film’s action in its objective spatial and temporal context. Which is not to suggest the long take presents a more objective ‘truth’ in any essentialist sense. Rather, it allows the action to be ‘played out’ before the camera, potentially demanding a more mentally active attitude from viewers required to read meaning into the image, rather than having the scene analytically broken down for them through a more classical editing schema. In Sokurov’s film, however, the single continuous shot functions as a stylistic choice allowing the narrator and audience to float over the surface of history, divorcing the scenes we witness from any kind of historical and political context. 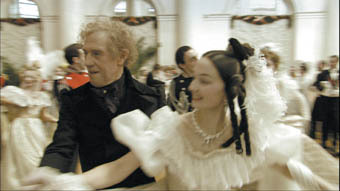 Although Russian Ark is ostensibly about history, it is history as a rather facile costume parade, blankly played out as a series of disconnected scenes held together by a wandering camera. The effect is of a sense of self-contained wholeness that allows the narrator to pass through countless historical episodes without ever having to stop and deal with the messy question of what it all actually means. Not that the film should provide definitive answers, but Sokurov does not seem interested in the questions pertaining to the historical period through which his film moves. This approach might have worked well as part of a critique of the hermetically sealed world of Russia’s aristocracy in the early 20th century. Rather, Russian Ark appears to maintain the same kind of blind, uncritical investment in the values and traditions of the pre-modern world as the historical characters themselves. While the sheer material grandeur of Russia’s upper classes prior to 1917 cannot be denied, it seems deeply abhorrent to nostalgically celebrate and mourn the passing of that grandiose tradition without any acknowledgment of the absolutely grinding poverty upon which this opulence was built. In the end, it was the sheer intensity of this poverty that brought down Russia’s royal ruling class, not the intercession of some ‘outside’ disaster, as the film seems to imply. Russian Ark’s final scene, in which the doomed aristocracy slowly exit their last great ball, positively drips with a sense of melancholy and mourning. The entire ball sequence is shot with a sumptuous celebratory glow. In contrast, of the 3 scenes that take place after 1917, 2 are shot in heavy shadow and near darkness. In one, the current director of the Hermitage discusses the extreme financial strain of preserving the Museum’s cultural riches, while in another we see a coffin maker working furiously during the siege of Leningrad in the middle of the Second World War. The modern world is associated with darkness, death and destruction, while pre-revolutionary Russia is uncritically celebrated as a world of eternal beauty, glowing luxury, and untroubled wealth. In this way, the film is a fundamentally dishonest dip into Russian’s history. Whatever horrors the country endured under the Communist regime, they cannot nullify the arrogance, stupidity, and cruelty of Russia’s royalty under the Czar. The tragedy of Russia’s history is not that the aristocracy’s last great ball took place in 1913, but that such an event was still taking place at a time when most of Europe was rushing head-long into the 20th century. If the aristocracy had spent less time ensconced in the dream world evoked in Russian Ark, and more time engaged with what was happening to their people, they might have spared themselves, and their country, the whole tragedy of the Russian Revolution. If Russian Ark has any lessons for Australian filmmakers, it is that technical innovation does not, in itself, represent something of value for cinematic art. When innovation is harnessed in the service of an essentially reactionary agenda it hides the implications of that agenda. Australia, like much of the world, is currently facing a deeply uncertain future, and the last thing we need is an uncritical retreat into a nostalgic, glossy dream of past repression.